This HTRF kit is designed for an accurate quantitative measurement of alpha synuclein aggregation in brain extracts. Monitoring alpha-synuclein aggregation is of great interest for studying the pathogenesis of synucleinopathies, a group of neurodegenerative diseases that includes Parkinson's disease (PD), dementia with Lewy bodies (DLB), diffuse Lewy body disease (DLBD), and multiple system atrophy (MSA). 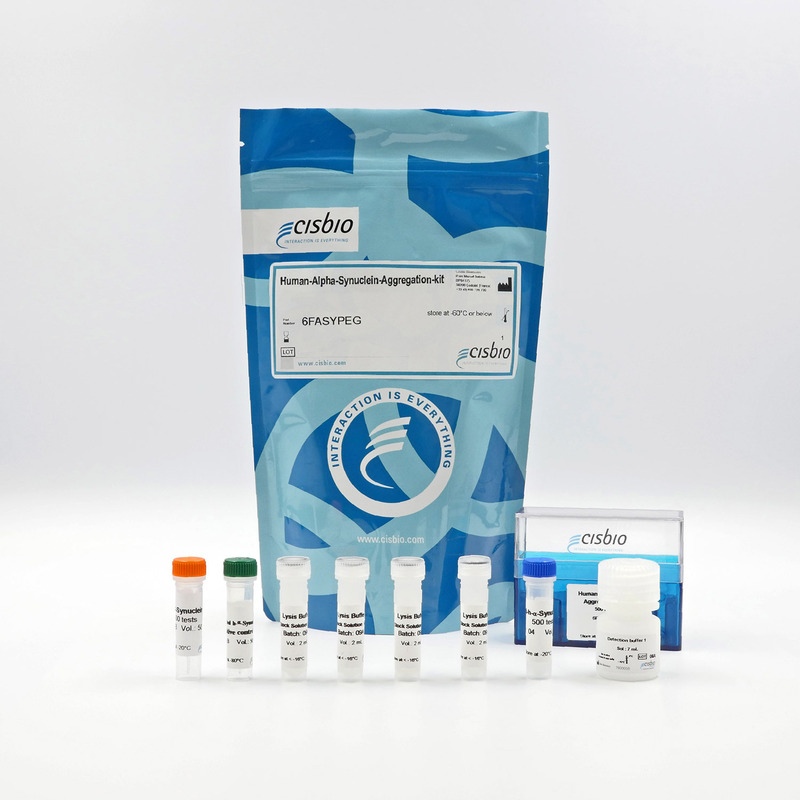 The kit provides a solution to rapidly detect and quantify protein aggregates of human alpha-synuclein in cell culture or brain tissue extracts. Alpha-Synuclein aggregates are measured using a sandwich immunoassay involving an anti-a Synuclein monoclonal antibody specific for alpha-Synuclein aggregate labelled with terbium-Cryptate or d2, ensuring assay quality, reproducibility, and signal quality. The specific HTRF signal generated is proportional to the alpha-Synuclein aggregates. The sample or brain extracts are transferred to the assay plate for the detection of a-Synuclein aggregates. The antibodies labelled with HTRF fluorophores may be pre-mixed and added in a single dispensing step to further streamline the assay procedure. The assay detection can be run in 96- to 384-well plates by simply resizing each addition volume proportionally. Samples from human putamen (Parkinson's versus control) were collected and lysed with a Cisbio lysis buffer. Due to the nature of the samples, the conventional cellular protocol needed to be adjusted. Incubation was performed for 20 hours at RT. Even at high dilution (1/64), clear discrimination between the two sample types is possible with Cisbio's aggregated alpha synuclein assay.